The pawpaw (Asimina triloba) has been called "America's forgotten fruit." Once quite popular among Native Americans and settlers alike, it fell out of the public eye until quite recently. If one considers the pawpaw "forgotten" then its relatives have been straight up ignored. Indeed, the pawpaw shares the North American continent with 10 other Asimina species. The genus Asimina belongs to a family of plants called the custard apple family - Annonaceae. It is a large family that mostly resides in the tropics. In fact, the genus Asimina is the only group to occur outside of the tropics. 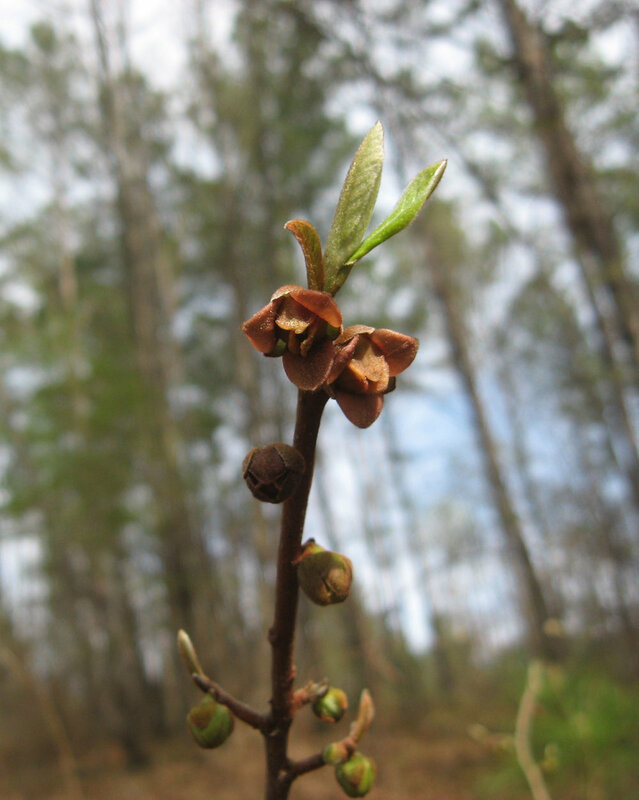 Though A. triloba finds itself growing as far north as Canada, the other species within this genus are confined to southeastern North America in coastal plain communities. As I mentioned above, there are 10 other species in the genus and at least one naturally occurring hybrid. For the most part, they all prefer to grow where regular fires keep competing vegetation at bay. They are rather small in stature, usually growing as shrubs or small, spindly trees. They can be rather inconspicuous until it comes time to flower. 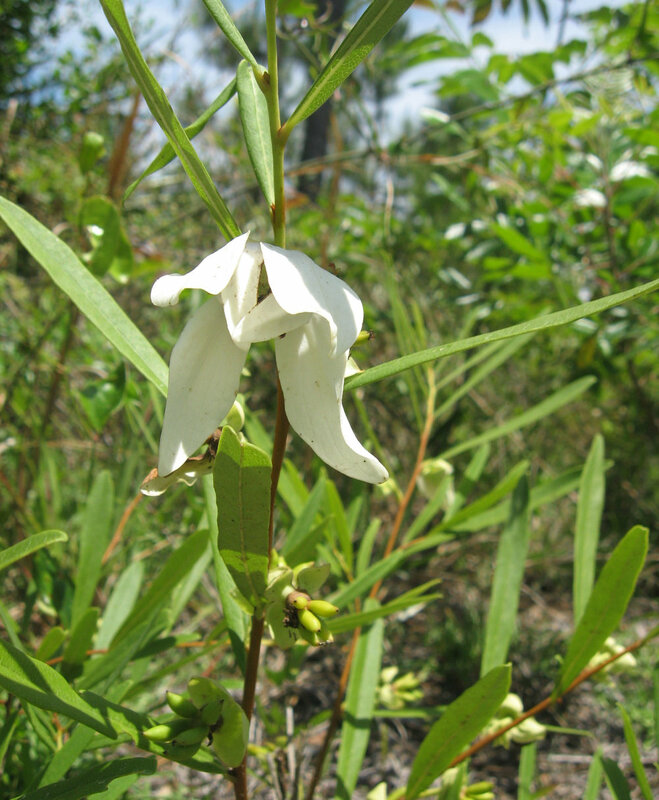 The flowers of the various Asimina species are relatively large and range in color from bright white to deep red, though the most common flower color seems to be creamy white. The flowers themselves give off strange odors that have been affectionately likened to fermenting fruit and rotting meat. Of course, these odors attract pollinators. Asimina aren't much of a hit with bees or butterflies. Instead, they are mainly visited by blowflies and beetles. As is typical of the family, all of the Asimina produce relatively large fruits chock full of hard seeds. Seed dispersal for the smaller species is generally accomplished through the help of mammals like foxes, coyotes, raccoons, opossums, and even reptiles such as the gopher tortoise. Because the coastal plain of North America is a fire-prone ecosystem, most of the Asimina are well adapted to cope with its presence. In fact, most require it to keep their habitat open and free of too much competition. At least one species, A. tetramera, is considered endangered in large part due to fire sequestration. All of the 11 or so Asimina species are host plants for the zebra swallowtail butterfly (Eurytides marcellus) and the pawpaw sphinx moth (Dolba hyloeus). The specialization of these two insects and few others has to do with the fact that all Asimina produce compounds called acetogenins, which act as insecticides. As such, only a small handful of insects have adapted to be able to tolerate these toxic compounds. Sadly, like all other denizens of America's coastal plain forest, habitat destruction is taking its toll on Asimina numbers. As mentioned above, at least one species (A. tetramera) is considered endangered. We desperately need to protect these forest habitats. Please support a local land conservation organization like the Partnership For Southern Forestland Conservation today!